On December 6 last, Johnny Hallyday, the idol of the young, died of cancer at the age of 74. The whole of France was devastated. Three days later, a million fans attended his national funeral. A first for a singer. But then Johnny had a unique bond with his fans. 3,200 concerts, 28 million spectators, 110 million records sold. The love story lasted half a century. We spent the first year without their idol alongside some of these fans. 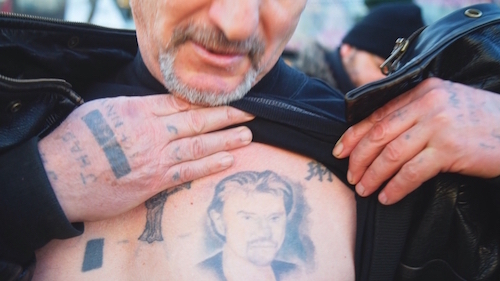 Some travelled France, others the world to keep the myth alive and celebrate Johnny’s memory. There’s Alain, the biker. He discovered Johnny and Rock in the orphanage. Ever since then, his “buddy”, as he calls him, has been his constant companion. Over the years, Alain, a born collector, has acquired some rare objects belonging to the singer. His proudest item: a motorbike bought at auction. Because Johnny also gave him the taste for “adventure and beautiful bikes”. So, with all his fellow bikers he wants to pay a roaring homage. They’re going to do a road trip as Rock’n’Roll as Johnny’s own: 750 kilometers around France. “Johnny achieved what no politician has really managed to do: bring people together. And bringing together is very important!”. For Joëlle it all began with an encounter. She was 12 when she skipped out of the orphanage to see Johnny Hallyday sing at the Golf-Drouot rock venue. It was a revelation. After that, she devoted her life to the singer. For 50 years, Joëlle followed her idol everywhere, attended all his concerts. “I don’t think people can understand. I’m often told it’s an addiction. Maybe Johnny really is an addiction. So I tend to bore people with it, but it’s bigger than I am”. Her devotion knows no limits. Nor does her expenditure on the star. The last will surely be the greatest: “to join” Jean-Philippe Smet on the other side of the world, in Saint-Barthélemy. For Pierre and Daniel, it’s as if the death of Johnny Hallyday tolled the death knell of their youth. A youth they will never forget. So they have set themselves a somewhat crazy challenge. For all the fans who can’t afford the trip to the islands, they want to create another shrine to the singer’s glory, in mainland France. More precisely, in the little village of Viviers, in the Ardèche, where the singer’s mother is buried. “It’s the only place in France where there’s the flesh, the heart, the soul for all the fans like us. We have Johnny’s flesh here, we have his DNA”. They plan to erect a 10’ statue there. The biggest ever. For that, they need money. However, their quest for donations may be compromised by the battle over the star’s estate.